After 10,000+ downloads on Google Play, the Premium version of VIPRE Mobile Security is now available for purchase worldwide. VIPRE Mobile Security puts your safety first, protecting your smartphone or tablet from over 10,000 known Android viruses. It’s the antivirus and security app that keeps hackers away, backs up your contacts and photos, monitors your device history and helps you find and secure your lost device for complete peace of mind. VIPRE Mobile Security detects and blocks malicious software that can affect your device’s functionality or steal your personal information. Use it to quickly scan for harmful apps or to dig deep for any malicious files. Best of all, VIPRE doesn’t slow you down or drain your battery (even during scans). VIPRE Mobile Security backs up your contacts and stores them safely online. VIPRE Mobile Security locates your lost device by sounding an alarm, even if the device is on silent. VIPRE Mobile Security Premium ensures your photos, contacts, bookmarks and more stay safe and recoverable – even if your mobile device isn’t – by backing up and storing your information online for easy, anytime access and transfer. VIPRE Mobile Security Premium can locate, lock or remotely wipe your device if it’s lost or stolen to prevent your data from falling into the hands of identity thieves and other cybercriminals. VIPRE Mobile Security Premium keeps track of when, where and how your device is being used with location tracking and web, text and call histories. Great feature for parents. 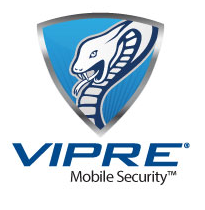 Visit the Google Play store to download VIPRE Mobile Security on your Android smartphone or tablet today. I’m glad to read the article. My question is does the program use up my mobil minutes while working or can it work from the WiFi mode. I keep the Data Plan on my Samsung turned off except when traveling out of town or when I’m not near a Wifi. Is the Premum Program FREE. The author did not say whether it was a subscribtion based program or what it cost would be. Hi David, thanks for your questions! While some of the features do require data usage, it is minimal. When connected to Wi-Fi, VIPRE Mobile Security will ONLY use the Wi-Fi signal and not your phone’s data plan. Some features, such as photo backup, will only happen over Wi-Fi. You can try VIPRE Mobile Security Premium free for 30 days. After your trial, it’s subscription based with a choice of $0.99/month or $9.95/year.